Our all day breakfast is served to you on a warm Red Velvet Brioche bun or on a classic Bun with a choice of juice or coffee. Not to mention our newly introduced Breakfast Muffins that are a great alternative providing fibre and fruit, with even healthier option of overnight oats that are soon coming! Using the best produce available POV try to offer the customer combined value for money and ethical alternatives to what is normally a convenience. A real emphasis and focus is based on quality of produce with customer interaction. 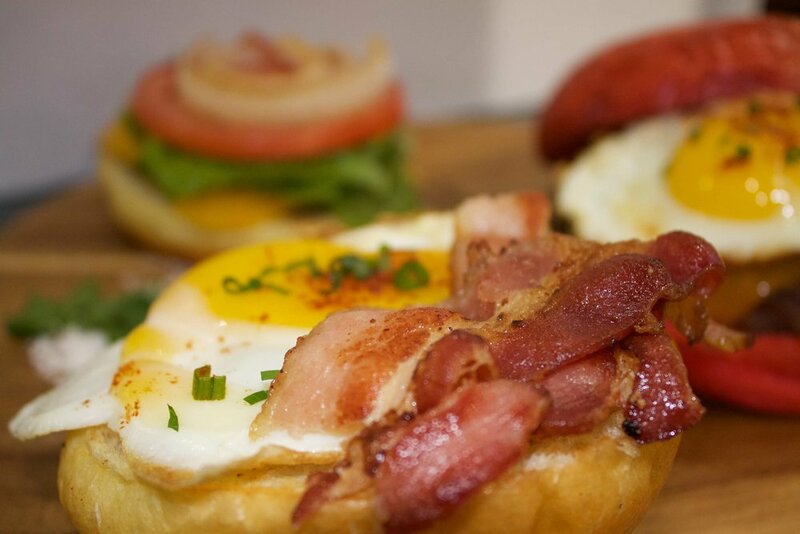 Applewood smoked bacon, cage-free over medium egg, cheddar cheese and chipotle ketchup in a warm brioche bun. Although a dessert focused bakery we have seen the value of aiding health as well as desire. Introducing overnight steel cut Oats as an option for the more conscious consumer with the option to add Superfoods, such as Acai. Fresh Strawberries, overnight steel Oats infused into a vanilla Velvet Muffin offers a lasting flavourful breakfast alternative that also boasts health options.